The Edgar Snow Symposium was held here in Kansas City the weekend of October 16-18. The initial goal was to launch edgarsnowproject.org at the symposium so I aimed to have it completed by October 16th. I did the final edits the night of the 15th and the site was presented on the 17th. I didn’t attend the symposium so, unfortunately, I wasn’t able to see any reactions to it. That’s where this project is different from anything else that I’ve done in my academic career. The papers that I’ve written have only been seen by the faculty or GTA’s who were in charge of the course or other classmates in cases where you post to a forum. This project isn’t just something that was going to be read, graded, and then put away to be forgotten about. This is a website that is going to be online forever or at least it will be available for people to see a lot longer than, say, a term paper would be. I felt a lot of pressure to create a quality product because I knew that a lot of people were going to be seeing the site and that some of these people were going to know a lot of things about Edgar Snow and his life. I see this as a positive challenge though, because now I have experience creating something that fits into the bigger picture of my career as opposed to just receiving a grade for a course. I feel like I have a better understanding of what it will be like once I start working in my career. Knowing that other people will be seeing your work forces you to work in a different way. Because of this, I now think that all students should do at least one internship so that they can see what it’s like to know that your work will be seen by a wider audience. This entry was posted in HistoryMaking and tagged digitalhistory, edgarsnowfoundation, edgarsnowproject, Writing on December 1, 2014 by Autumn Neal. The main task in building the Edgar Snow Project website is combining the five sections that my class mates and I worked on individually in the spring semester. We each had our own exhibit consisting of a few years that we divided up and named based on significant changes in Snow’s life. The first thing I had to do was make all five of our essays into one complete text. The challenges behind this have been that we all have different writing styles, different ideas about which information should be included, and different ways of presenting that information. My first step was to rewrite all the text so it sounded like one person wrote it as opposed to four. Obviously, there were quite a few areas where the original author did a better job than I could have. There were also some sentences that were worded so well I had to find a way to make the text flow but still honor what they wrote. The next issue was the amount of writing we had. If I remember correctly each of us wrote 2000 words that were divided up between the main narrative, exhibit item descriptions, and other information attached to places on the map. Did I say that before? The website is an interactive map. It will show Edgar Snow’s life in terms of his movements around the globe. Each important stop will have a clickable dot that opens an item. The items will be photos, articles, letters, and excerpts from books or journals. I’ll write a post specifically about the items at a later date. Back to the main point, that’s almost 10,000 words. That is way too much text for one page. I had to reduce that number to 3000-4000 words. It was difficult choosing what to delete, keep, or try to incorporate into exhibit items. I guess we’ll see how well it worked in the next few weeks. This entry was posted in HistoryMaking and tagged digitalhistory, Digitization, edgarsnowfoundation, edgarsnowproject on November 12, 2014 by Autumn Neal. 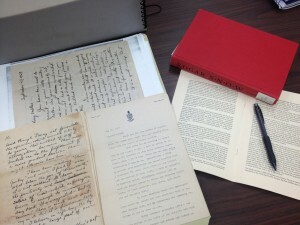 In my last post, I talked about going through the letters and photos of the Edgar Snow Papers at the State Historical Society. After choosing the items I wanted to use, I had to digitize them and before this assignment I only knew how to use a basic scanner. Even though I had a lot to learn and got confused a few times, the process of digitizing the documents was entertaining, as least for me. 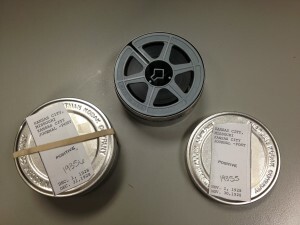 I learned about archival standards such as the required scan resolution, file names, and the information that needed to be attached to each file. We also learned how to use Photoshop which, by the way is amazing. I had never used it before and now I have a hard time using other photo editors. When I was scanning the newspaper articles I had chosen, I decided that the copy of the “Kansas City Boy Stowaway” article that I found wasn’t in very good shape and thought I would have to scrap it. The very helpful women at the Historical Society told me that it was on microfilm and I could request it to get a better copy. They ordered it for me from who knows where, emailed when it arrived, and helped me get the viewer set up. I looked through a month’s worth of newspapers from the 20s. In another class of mine, I am writing about advertisements from the 1970s and having that experience helps with the way I’m looking at my other paper. Even if you’re not doing research, looking at old microfilm would be a good way to entertain yourself while learning something at the same time. This entry was posted in HistoryMaking and tagged digitalhistory, Digitization, edgarsnowfoundation, Historic Preservation, HistoryMakers, Public History in KC on October 16, 2014 by Autumn Neal. Edgar Snow: Books, Books, Books. My last post was about the main text for the Edgar Snow Project website. There was one aspect of it that I didn’t address last time that is pretty important, the two books I used as references. 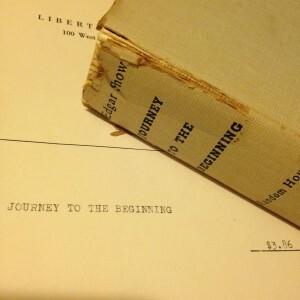 In 1958, Snow published his memoir, Journey to the Beginning. If you haven’t read this book I highly recommend it. It flows well and is so captivating that instead of scanning for information I would catch myself reading chapter after chapter. I’m also pretty sure that Snow embellished some stories but, hey, all authors do that right? It’s what makes journalism so interesting. The only issue is that the memoir is not in order and Snow didn’t write dates to go along with his stories. In the process of rewriting, I was trying to figure out how to order certain events and the book may have made that harder. I bought this used copy from Amazon that had the original sales receipt from Liberty Book Club, New York City. It sold for $3.86. The second book I used is a biography on Snow by John Hamilton. This book was really helpful because it covered facts that Snow did not address in his memoir, such as his early life, as well as events that occurred after Journey to the Beginning. Hamilton’s book sometimes focuses on topics that weren’t relevant for this project. It was challenging trying to combine the information from the entertaining memoir and the serious biography into an accessible but professional narrative. I think that the site text is unique though because of the mixture of information from these two books and the information gathered from the archives. 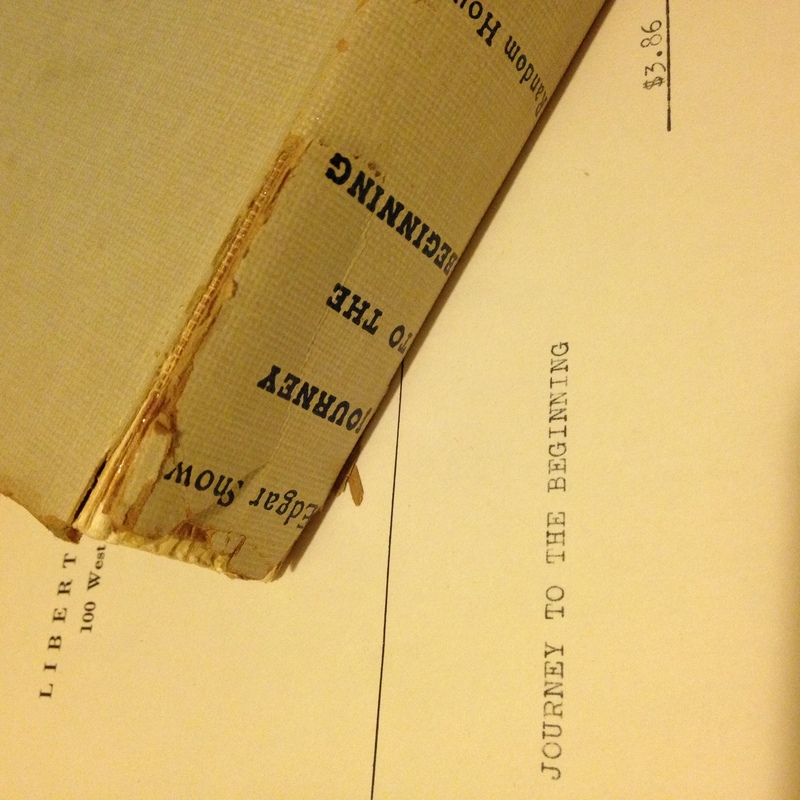 This entry was posted in HistoryMaking and tagged books, digitalhistory, Digitization, edgarsnowfoundation, edgarsnowproject, photo on October 7, 2014 by Autumn Neal. Hi! My name is Autumn Neal and I’m in my last semester as a History undergrad. My concentration is Antiquity but I’m also very interested in the history of Kansas City. This semester I’m working on a website that we are calling the Edgar Snow Project. I’ll share the link here once it’s all done. This is a website that three other students and I started work on in our Digital History course this past spring. The focus is on a journalist from Kansas City who was vital to our knowledge of Communist China as well as the communication between the U.S. and China in the 70s. The site will be shown to attendees of the Edgar Snow Symposium here in Kansas City that runs from October 16 – 18. There will be artists, educators, and government officials from both the U.S. and China in attendance. That’s kind of a lot of pressure…but a good pressure. I’m excited about it. The plan is to write weekly about the process of building the website and the challenges I’m sure I’ll face along the way. Let’s be honest, I’ve already run into quite a few. Since I’ve been working on this for a while, I’m sure that I’ll go back in time every couple of weeks and post about something from last semester. The process of digitizing photos and learning how to work with new tools was difficult but fun and I’d like to share my experiences with everyone. This entry was posted in HistoryMaking and tagged digitalhistory, Digitization, edgarsnowfoundation, edgarsnowproject on September 11, 2014 by Autumn Neal.